After breakfast, visit Historic Monument Red Fort- built between 1638 - 1648 with marvelous red stone, Jama Masjid- the principal mosque in India was built in 1650 both are constructed by Mughal emperor Shah Jahan, Chandani Chowk- a shopping hub you can enjoy Rickshaw ride in Chandani Chowk. Rajghat- interment site of Mahatma Gandhi (Father of the Nation). President House- earlier recognize as Viceroy’s House was built in 1921, now the authorized residence of President of India. India Gate- war memorial built in 1931 and designed by Sir Edwin lutyens. Humayun’s Tomb- Humayun specially made this tomb for his wife Hamida Banu Begum in 1562 (UNESCO World Heritage site), Lotus Temple- also known as Baha'i house of worship, Qutub Minar– UNESCO World Heritage site was built in 1192 by Qutub-ud-din Aibak. Overnight at hotel. Early morning, depart to Jaipur. On arrival transfer to the hotel. In the evening enjoy rickshaw ride to explore the multi-colored market of Jaipur. Overnight at hotel. After breakfast, visit Amber Fort- it was built in 16th century, enjoy the experience of elephant ride , Hawa Mahal (Palace of Winds)- built by Maharaja Sawai Pratap Singh in 1799, Jantar Mantar- an astronomical observatory site built in 18th century by Maharajah Jai Singh II, later drive back to visit imperial City Palace- a miraculous palace to witness the real Rajasthani and Mughal architecture of Jaipur built in 1729 by Sawai Jai Singh II and later visit City Palace Museum. Overnight at hotel. 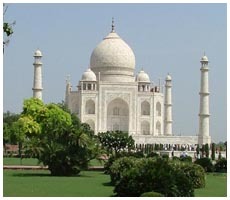 After breakfast, visit Taj Mahal- UNESCO World Heritage Site and one of the seven wonders. It was built by Mughal King Shah Jahan for his wife Mumtaz Mahal in 1652. Taj Mahal the symbol of love eternally, the most famed evergreen monuments in the world. 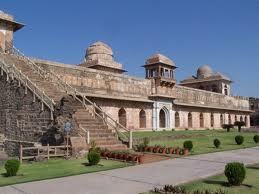 Later that visit Agra Fort- inbuilt marvellous red stone by Mughal King Akbar the great in 1573. In the evening transfer to railway station to board the train to Bhopal. On arrival transfer to the hotel. Overnight stay in hotel. After breakfast, explore Bhopal- this beautiful mid-sized city and one of the greenest city in India. Visit Jama Masjid- built in 1837 by Qudsia Begum, Taj-Ul-Masjid- "the Crown of Mosques", one of the largest mosques in Asia and built between 1868 - 1971 by Nawab Shahjehan Begum, Fatehgarh Fort and Moti Masjid- built in 1860 by Sikander Begum. After lunch drive to Bhojpur to see the superb Shiva Temple. In the evening visit Bharat Bhavan- multi art centre, drive back to Bhopal for overnight stay. After breakfast, drive to Ujjain- famous for Kumbh Mela and Temples. On arrival transfer to hotel. After relaxation visit Mahakaleshwar Temple, Ganesh Temple and Jain Temples. Later drive to Indore, on arrival transfer to the hotel for overnight stay. After breakfast, explore Indore- famous for Temples, Arts and Culture. Visit Rajwada- this seven-storey historic palace known as Holkar Palace, it is 200 year old and built by Holkar rulers, Lalbagh Palace- built between 1886 - 1921 by Tukoji Rao Holkar II and Tukoji Rao Holkar III. Later that visit Kanch Mandir- this Jain Temple also known as Glass Temple, built in 20th century by Sir Seth Hukumchand Jain, later visit the Bada Ganapati- famous for widely size of the Ganesh idol, built by Shri Dadhich in 1875. In the evening visit famous Khajuri Bazar of Indore for shopping. Late evening drive to Mandu, on arrival transfer to the hotel for overnight stay. After breakfast, explore Mandu- this fortress town famous for his fine architecture, visit Vindhya hills- range of older rounded mountains and hills, Jahaz Mehal- known as Ship Palace and built by Sultan Ghiyas-ud-din-Khilji, Rewa Kund- built for supplying water to Rani Roopmati Pavilion by Baz Bahadur, Hindola Mahal- built by Hushang Shah in 1425 and later visit Jami Masjid. In evening drive to Maheshwar, on arrival transfer to the hotel for overnight stay. After breakfast, explore Maheshwar- famous for Temples. 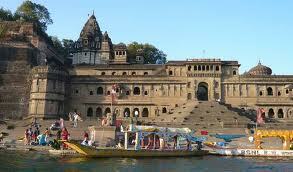 In Maheshwar, visit Temples and Ghat. Later drive to Jalgaon, en route visit Omkareshwar- famous pilgrimage center for Hindu religion, on arrival visit Omkar Mandhata Temple- dedicated to God Shiva. Later drive to Jalgaon- this a quiet industrial city famous for Cotton, Gold and Banana trade. On arrival transfer to the hotel. Overnight stay in hotel. After breakfast, drive to Aurangabad- world famous for many historical monuments, enroute visit Ajanta Caves- the masterpieces of Buddhist art and listed in a UNESCO World Heritage site. 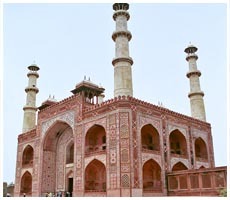 Later drive to Aurangabad, on arrival transfer to the hotel and after relaxation visit Bibi Ka Maqbara- known as the Mini Taj Mahal and built in 17th century by Mughal Prince Azam Shah for his mother. In the evening visit colorful market of Aurangabad for shopping. This market famous for major silk and cotton textile. Overnight stay in hotel. After breakfast, drive to Ellora Caves- known as Ellooru, world famous Caves built between 5th-7th centuries and listed in UNESCO World Heritage site. 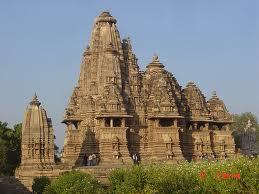 Mostly temple are dedicated to Brahmanism, Jainism and Buddhism. Later return to Aurangabad, on arrival transfer to the airport to board the flight for Mumbai- a Business and the Entertainment (Bollywood) capital of India. On arrival transfer to the hotel for overnight stay. After the breakfast, proceed to visit Gateway of India- built in 1924, Elephanta Caves- world Heritage site declared by UNESCO in 1987, located at Elephanta Islands, Temple of Trimurti- also known as Triple headed “Lord Shiva”. 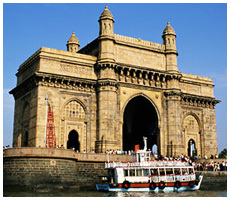 Later visit Prince of Wales Museum, Taraporewala Aquarium, Parliament House, Marine Drive, Jain Temple and Hanging Garden. Late evening transfer to International airport to board the scheduled flight to hometown and tour concludes with happy memories.